Joy in the Journey: Simple Nutrition + Simple Fitness = Fast Results! Fixing it up! Simple Nutrition + Simple Fitness = Fast Results! Fixing it up! So, an update on the drain: it's fixed! I can cook and run the dishwasher again. It's the little things, right? Unfortunately my basement is still unusable due to some construction scheduled to take place this week. A little backstory: we have owned our house for 5 ½ years during which time, any time it rains, there is literally a river running through it from one corner to the drain in the center of the basement. This stream has brought dirt and sludge along with water and has been a pain point since we bought the house. This week, though, we have a crew coming in to fix it! But in order to fix it, we had to completely empty out the basement – including my fitness equipment, weights, and TV setup. And since they are pouring fresh concrete, the basement must STAY empty until Saturday or Sunday at the earliest. Now, for those of you keeping track, that means I will have missed just over two weeks of P90X3 workouts, setting me back quite a ways. So I have a new plan. My biggest struggle in my entire journey is nutrition. I have no issues working out. It makes me feel strong and powerful. I love the feeling that sweating leaves me with. I love the endorphin high. And there is nothing like the feeling of lifting something with ease that I could previously barely heave. However, I am one of those people that if there is food in front of me, I will overeat. And yes, you CAN overeat on healthy food! I need something to tell me exactly how much to eat without overanalyzing everything. I don't mind counting calories, but if someone even took the guesswork out of that, hey, I'm definitely on board!! Well, guess what? Someone DID! There's a new program that targets my biggest weakness with a simple strategy for portion control. The strategy is as simple as it gets. See those colored containers in that image to the right? Each one is designated for a certain type of food, and you get a certain number of each one per day, depending on your weight and caloric needs. In a nutshell, if it fits, you can eat it! Simple, right? And simplicity is the main tenet for the 21 Day Fix. 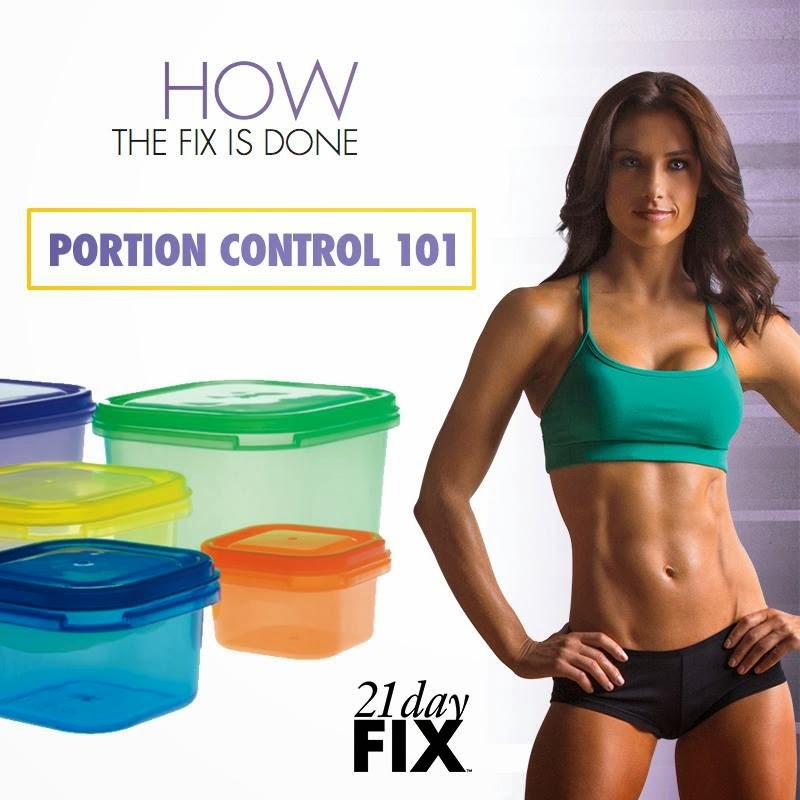 Best part (in my opinion) of the meal plan for the 21 Day Fix? There are instructions on how to adapt the eating plan to other Beachbody programs (like P90X3, for example). 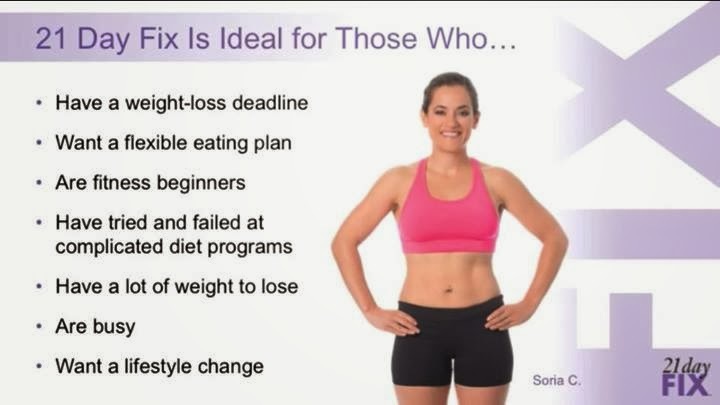 Of course, no wellness program is complete without a fitness component as well as nutrition, and the 21 Day Fix has followed the trend of Focus T25 and P90X3 with workouts that all come in at 30 minutes in length - perfect for busy working professionals or moms of young children or anyone else who can't seem to find an entire hour to themselves all day! From the words of the test group, these workouts are no walk in the park, either! Still, the workouts are only 30 minutes a day, and they're perfect for any fitness level. Therein lies the simple fitness part of the equation. In a nutshell, the Fix is for EVERYONE. Did I mention it was only 21 days? Do you have a vacation coming up? Are you on a deadline? Then the Fix is for you! Are you just starting out? Do you need immediate results? Then the Fix is for you! Do you need help with portion control (like me!)? Then the Fix is for you! Do you want to still enjoy chocolate and wine? HOLD ON A MINUTE!! Did I just say CHOCOLATE and WINE??? Yes, I did! Guess what? The Fix is for YOU, too! Do you have trouble completing a program? The Fix is for you! In short, the Fix is for anyone who wants to change his or her life! 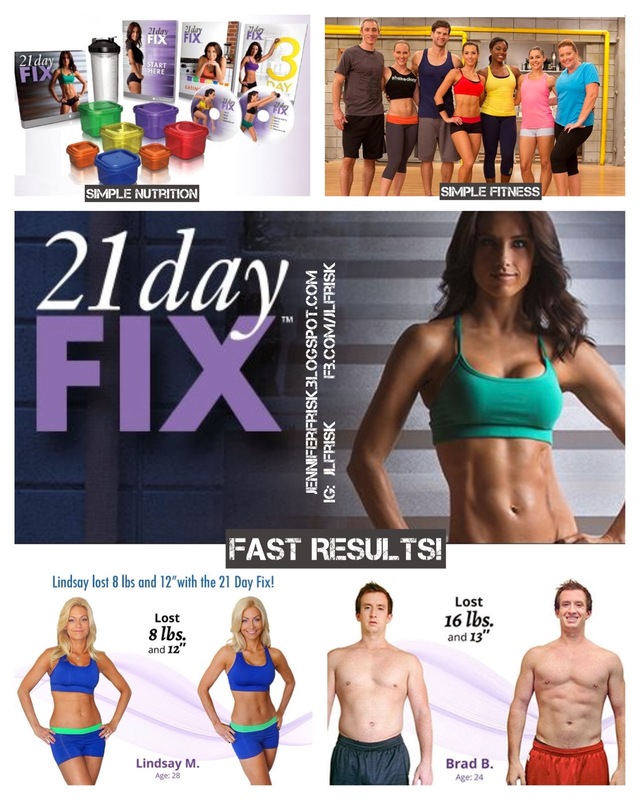 All that to say, my new plan is the 21 Day Fix to get back in the game. And THEN I will return to my dates with Tony and his one-liners. So, who wants to join me? In February only, you can get the entire program for $10 when you buy Shakeology. Awesome, right? Contact me to find out how!